Dermatologists and plastic surgeons are performing facial surgeries with increasing frequency because of the increase in skin cancer incidence. Therefore, attention to the aesthetic outcome of the different types of sutures is warranted. 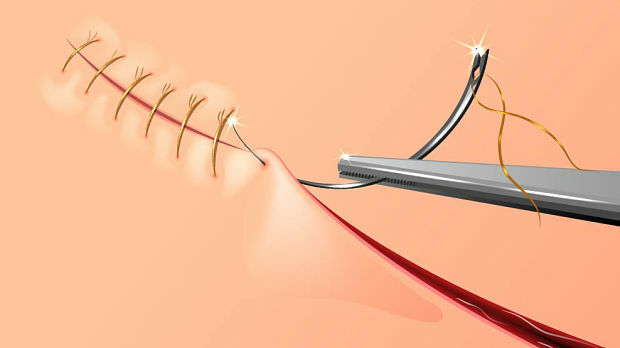 Previous studies have suggested that the cosmetic outcome of using simple interrupted sutures (SIS) or running subcuticular sutures (RSS) is similar, and guidelines leave the choice of suture type to the surgeon. A recent study compared the long-term aesthetic outcome and incidence of complications of facial wounds closed with SIS and RSS. Adult patients receiving conventional excision or Mohs micrographic surgery (MMS) on the face were randomized into 2 groups: 1 receiving SIS and the other RSS. The primary outcome was the aesthetic outcome 12 months after surgery and secondary outcome measures were the incidence of complications. Cosmetic results were evaluated shortly after surgery and 12 months after surgery. The results showed that at 12 months, both observers and the patient rated the aesthetic outcome of SIS and RSS as equal. RSS was associated with a slightly higher rate of hyper- or hypoesthesia, but other postoperative complications occurred at a similar frequency in both groups. There were some differences in how the observers and patients rated their satisfaction with the appearance of scars, and other aesthetic features, but overall cosmetic appearance of SIS and RSS were equally rated. They gave a slight edge to simple interrupted sutures in facial surgeries due to the higher rate of dysesthesia seen with running subcuticular sutures. The authors note that this confirms results seen in earlier studies.